Yes, your eyes are right. I am back! After some weeks of hard work I am pleased of being able to share some time with you! I hope you didn’t forget to take a look to my humble blog. In my first post, I introduced myself, my host company, and the research project I have enrolled. You could outline that I am consecrated to uncertainty as my TRUSS colleagues are, but focused on submerged nuclear racks and its nonlinear behavior under seismic loads. In this second post, I would like to provide further details about what a rack is. 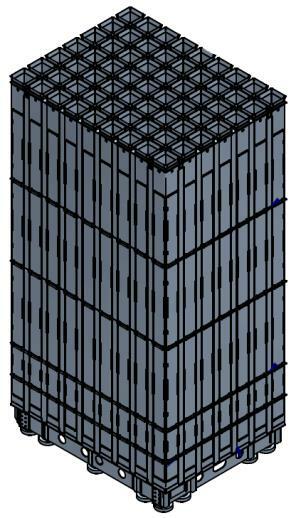 High Density Spent Fuel Storage (HDSFS) racks are 60 tons and 5m high steel structures designed to hold nuclear spent fuel assemblies removed from the nuclear power reactor after having been irradiated. They are used in the first step of the waste management process, during the wet storage inside the Fuel Storage Pool. Since they are designed to maximize the storage capacity, there may be numerous free-standing racks nestled in the depths of the spent fuel pool separated by only a few centimeters. nuclear regulation imposing the highest seismic requirements. To sum up, the seismic analysis of racks deals with a fluid-structure interaction problem, a very high nonlinear behavior and a transient dynamic response. Industry is currently using finite element analysis software to solve these three problems in a cost-effective manner but some dispersion of results still exists. In order to evaluate the current uncertainty a deep knowledge of the different analysis methodology will be necessary.